Recent design projects have included: D-Cinema Multiplex Server, and Screen Server systems, and Operating Software, as well as a new 4K resolution Digital Cinema Projector design, the first to be based on a Magneto-Photonic imager . All recent software development has been in Linux, Java, and Windows. An Industry-first JPEG-2000 based Digital Server System. Mathias designed the Digital Cinema industry's first Multiplex-wide Theatre Management System (TMS) including screen server, network architecture, and central content server that allows operation and management control from anywhere within the multiplex. Design of the system began in 2003. A "distributed inteligence" design concept made error reporting, troubleshooting, and system management simple and fast, for local technicians or remote support sites, without compromising content security. This product was introduced to the Cinema Industry on October 12, 2004, well before any other such systems existed. 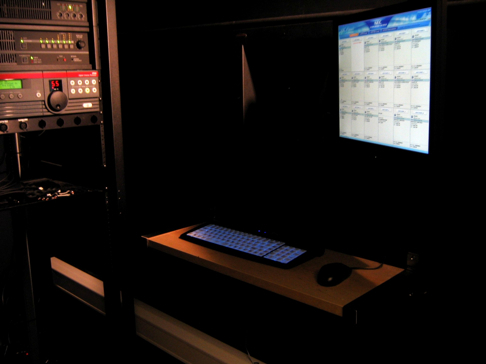 Fibre Channel based, this pioneering Digital Cinema server and central library system, allowed content to be moved between theatre screens faster then other method. This minimizes the challenge that multiplexes face on Thursday nights, when all the new movies arrive from distribution, at once. This was the first design of a multiplex-wide system capable of supporting any required number of screens, making this the most scalable and reliable system in the industry. Individual Screen server hard drives are Shadowed by the Fibre Channel SAN disks for instantaneous failover in the event of a screen server disk failure. This Fibre based network design also allows extremely high-speed file transfer rates to the screen servers, a vital feature, when movies must be moved to a new auditorium while the audience waits. This DCI requirements compliant Digital Cinema server system supports the full security specifications and studio requested features outlined in the DCI (Digital Cinema Initiatives) specification. As the only “virtual” control system on the market, it allows an operator from anywhere in the cinema multiplex, or at a remote district office, to control any screen in the multiplex. Combining state-of-the-art technology with ease of use, this Digital Cinema server software incorporated the cinema industry’s own language in the user interface, minimizing training requirements. Harry Mathias designed many unique products for the cinema industry, and has contributed to many other designer's patents. He was the sole inventor of two of his patents, and was the key inventor who led the development team on three more. Four of these patents are for a Digital Cinema Server system, theatre operating software, and the overall system architecture. These four patents are now owned by NEC. Another Mathias design patent was the Anti-reflecting Filter Frame. This product is now used by 98% of Panavision customers, on major films. For more information on our system designs, please contact us.